The protesting workers said the government had failed to honor promises made to them regarding wages and permanent jobs. Chanda, a Dalit (a member of the ‘untouchable’ castes) woman from Mewat in the Indian State of Haryana, wept while remembering her husband who died in 2011. She has been taking care of her two daughters and a minor son since then. Chanda works as a midday meal worker at a government-run primary school. On February 8, for the first time, she joined hundreds of her fellow midday meal workers to protest the “anti-worker” policies of the far-right Narendra Modi government, and to express their solidarity with 248,000 midday meal workers from the State of Bihar who have been on an indefinite strike since January 7. Speaking to Newsclick, Chanda said, “I have been working as a midday meal worker at a primary school for the past 7 years. I wash utensils and clean the school. I wash 150 utensils four times a day and I receive Rs 2,500 (USD 34) a month for this work. How can I run my family with this amount? In Bihar, our sisters on strike. We stand with them. Nearly 2.6 million workers, mostly women belonging to backward sections, are employed in the midday meal program, which was designed to provide nutritious meals to crores of school-going children. The scheme has played a transformative role in Indian society but those working for it are poorly paid. They toil for at least 6-8 hours every day and are yet not recognized as workers. They are paid a pittance of Rs 1,000-2,500 (USD13-34) a month and that too for only 10 months in a year, devoid of any social security. Speaking to Newsclick, A.R. Sindhu, vice-president, Midday Meal Workers Federation and secretary, Centre of Indian Trade Unions, said, “The struggle of mid-day workers has been going on for a long time. Since this scheme has been launched, the workers have been asking for minimum wages. The workers mostly belong to backward sections of society and the wages they receive are paltry. During the 2013 labor conference, the government had given a written assurance that the demands of the workers would be implemented. But nothing has been done so far.” The 45th Indian Labour Conference she is referring to was held in May 2013. During the conference, it was recommended that the midday meal workers should be recognized as workers, paid minimum wages and social security, including pension. The major demands of the workers during the protest were: a) increase in remuneration up to minimum wages b) salary for all 12 months instead of 10 c) 180 days paid maternity wages and d) an end to privatization of the midday meal scheme. The workers accused the Modi government of trying to privatize the mid-day meal scheme by handing it over to the corporate NGOs. “There is a close nexus between the corporates and government. Corporates like Nandi Foundation, Vedanta and others have been roped in,” said Jai Bhagwan, general secretary of the midday meal workers federation. 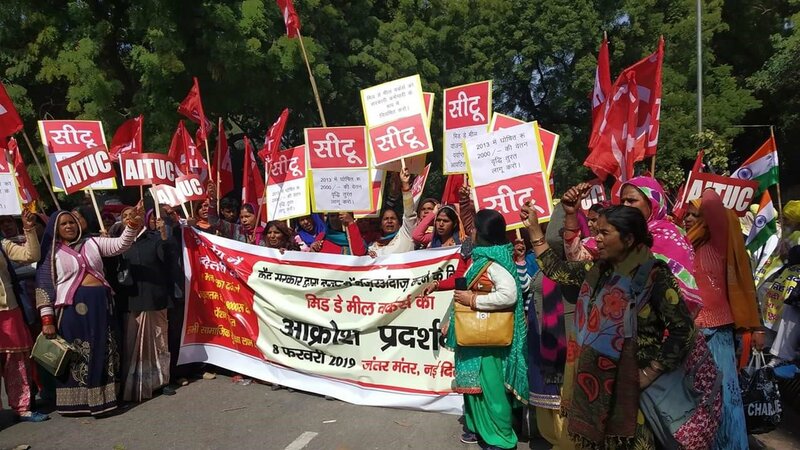 The workers, who were determined to carry forward their struggle, expressed their anger against the Modi government with clenched fists and slogans renting the air. Jo sarkar Nikami hai, woh sarkar badalni hai, (Change the government that does not work) they said in unison. Hey Buddy!, I found this information for you: "Hundreds of thousands of midday meal workers protest in India demanding minimum wages". Here is the website link: https://peoplesdispatch.org/2019/02/11/hundreds-of-thousands-of-midday-meal-workers-protest-in-india-demanding-minimum-wages/. Thank you.